Posh skipper Chris Forrester tussles with Charlton's Ademola Lookman. A first-half header from Ryan Tafazolli and a terrific goal from Gwion Edwards midway through the second-half sealed a second win in a row for Posh who remain sixth in League One. Posh defender Michael Bostwick tries to block a shot from Charlton's Fredrik Ulvestad. Edwards almost missed the game after falling ill this morning, but instead he claimed his eighth goal of the season to move alongside Tom Nichols at the top of the club’s scoring charts. McCann said: “We were very good for 75 minutes today. Only at the start of the second-half when we were a bit slow out of the blocks did we struggle to get going. “But I can’t grumble at that really. It was an outstanding display against a good side on their own pitch. We were generally dominant and we could have won by more than two goals. “For most of the match Charlton couldn’t cope with our energy and pace. We pressed hard to get the ball back as soon as lost it and to a man we’ve put a great shift in today. Posh striker Shaquile Coulthirst chases the ball and Charlton's Fredrik Ulvestad. “We were strong at the back and very good on the break. “Paul Taylor’s delivery of the free kick for Ryan’s goal was perfect. I brought Ryan to the club mainly because he’s a great defender and a leader, but I fancied him to score a few goals as well. “And what a goal from Gwion, He was close to not playing today as we couldn’t get him off the toilet before the game, so to get 75 minutes from him was pleasing. “Defensively we were very strong again. It’s the fact that the back four have so much confidence in their own ability that enables our attacking players to play with so much freedom. They push the likes of Leo Da Silva Lopes and Chris Forrester forward. Marcus Maddison missed the match after suffering a reaction to some heavy training sessions this week. He was declared fit on Thursday, but felt his ankle wasn’t quite right on Friday. McCann revealed he is trying to keep on-loan midfielder George Moncur for the rest of the season. Barnsley have agreed so it’s up to the player. 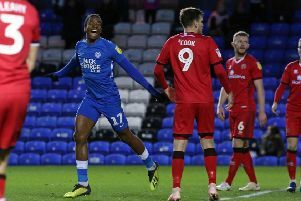 Posh are next in action on Tuesday (December 20) when they tackle League Two side Notts County at the ABAX Stadium for the right to play away to Chelsea in the third round of the FA Cup on January 8.